The cost of running a healthcare business continues to rise, making it difficult for providers to offer affordable services and still make a living. This situation prompted Nick Porterfield to develop a way to help healthcare providers reduce their office costs. Earlier this year, Porterfield and his business partner opened America’s Health Center in Gilbert, Arizona. The center functions as a coworking space for healthcare providers, helping them save money by bundling rent, utilities, internet, and other overhead costs. As part of this effort, Porterfield went in search of a digital reception system to eliminate the cost of having a full-time employee at the front desk. “I really didn’t feel like it was necessary to have an actual person sitting at the front to check people in and out,” he said. “I knew I wanted some sort of system that could do that, but I didn’t know it existed. I thought I’d have to find someone and pay them a bunch of money to develop it.” Fortunately, that wasn’t necessary! Porterfield told his business partner what he was thinking, and, soon after, his partner’s girlfriend sent him an email about The Receptionist for iPad. “It was exactly what I was looking for,” he said. The Receptionist for iPad now serves 14 providers in America’s Health Center. The visitor management system notifies providers when a patient arrives, and it invites patients to take a seat with the assurance that their provider will be with them shortly. The best part? “It’s so simple,” Porterfield said. “I’m able to set it up in a way where patients click the check-in button, choose their provider, and type their name. That’s it.” America’s Health Center opened in January 2017, and they’re growing quickly. With the current popularity of coworking and resource sharing, Porterfield’s innovative model will likely take off in healthcare and beyond, and we’re delighted to play a role in making office space more affordable for healthcare providers. To learn more about how The Receptionist for iPad can benefit your business, sign up for your free 14-day trial today! 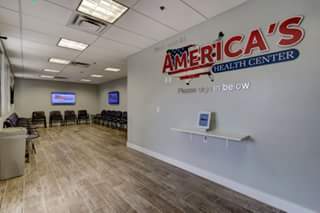 About America’s Health Center America’s Health Center leases premier office spaces to health care providers from different disciplines at a low cost. America’s Health Center bundles rent, internet, and utilities into one low price allowing providers to keep a low monthly overhead. Additionally, having providers from different disciplines leads to increased referrals.